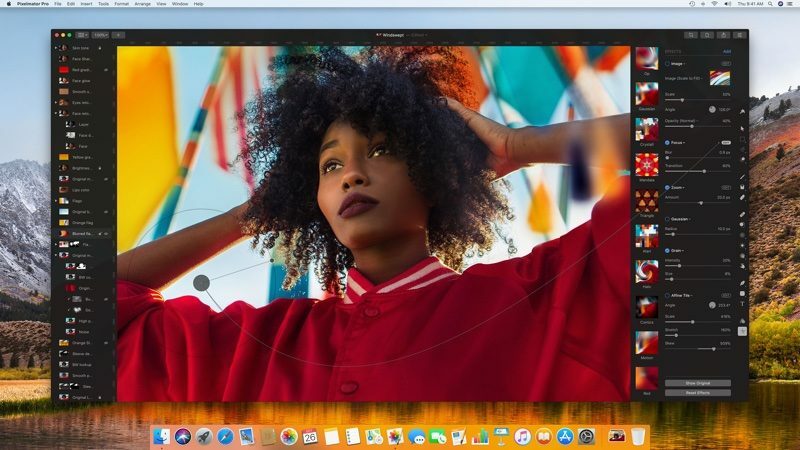 Popular photo and image editing software Pixelmator Pro was today updated to version 1.0.6, adding customizations for the crop tool along with a whole slew of other improvements and bug fixes. According to the Mac App Store release notes, the update introduces an option for custom aspect ratios for the crop tool, which can also be saved as custom crop presets. This should make cropping to your exact specifications quicker and easier even across different projects. With this new version of Pixelmator Pro, files exported to JPEG will be saved with a .jpg extension instead of .jpeg, and files can now also be exported in BMP and GIF formats. Use the Crop tool to crop with your own custom ratios. Create and save custom crop presets. When using the Type tool's Color Picker, pressing the Escape key will now close the Color Picker, as it should. Dozens of additional bug fixes and small tweaks included in Pixelmator Pro 1.0.6 are listed in the Mac App Store update history. Pixelmator Pro, released in late November, is an updated and more advanced version of Pixelmator, which has been a popular photo editing app on Macs for years now. Pixelmator Pro was built from the ground up for the Mac and it takes advantage of the latest macOS software additions like Core ML, Metal 2, and more. Compared to Pixelmator, Pixelmator Pro offers a reimagined workflow with simplified and streamlined editing tools, a single-window editing interface, intelligent image editing features powered by machine learning, a new painting engine, an improved repair tool, and much more. All of these PixelMaker updates are the same. “Now with this new feature that Photoshop has had for 3 Years”. True. But at a fraction of the price and without a subscription, I'm ok with it. Eh, if you're wanting to avoid Adobe, Affinity Photo and Affinity Designer are where it's at right now. probably the first time I've heard anyone complain about a dark mode. I'm not saying don't since everyone has their preferences, but I'm rather surprised to read this with all these other posts complaining about, say, a lack of a dark mode in iOS for example. Plenty of folks not too happy with it though, if you look around. Like here ('http://www.pixelmator.com/community/viewtopic.php?f=4&t=7630&hilit=no+more+black&sid=7daf3ee48ec1a859793ecf7f846ce73e'), where folks have been complaining about it for years. Best way to go for creative apps is to provide a mid to dark grey GUI colour. Like Autodesk Maya, Foundry's Nuke and Mari for example. Photoshop's got it right too. But yeah, it really should be a preference to cater to everybody's tastes. Don't hardcode it in. That black interface is such an eyesore. So unpleasant to work with. I find it bizarre that the developers are unwilling to provide preference options for this. They must be missing out on a significant chunk of revenue with their stubbornness. Affinity is where it's at. Totally agree. I can't stand it as I see myself reflected by my iMac's reflective screen. I told them years ago, no way. I bought Affinity Photo, which is just fine. I can't believe they're so stubborn, why don't they offer an alternative? Like Grey or Dark Grey. No, it MUST be black. They lost a customer and I'm definitely not alone. You’re definitely in the minority on that. Most people here love dark mode. I find it much more cleaner and less strain on my eyes. Lots of people complained. And even if minority, why not offering an alternative? And about strain on my eyes, that's exactly the problem I'm having with a black interface. MORE strain, not less. Generally speaking I always prefer to be able to choose, I don't like when others choose for me. The same holds true for the iMacs' reflective screen. Unbearable, to the point that I won't buy another one. That black interface is such an eyesore.